Big Apple Chalkboard (mswwcbigapp) at Pure Design Kids / Toys / Chalkboards ::: Kids' Toys, Furniture and More at Pure Design Kids! You know what they say about an apple a day! 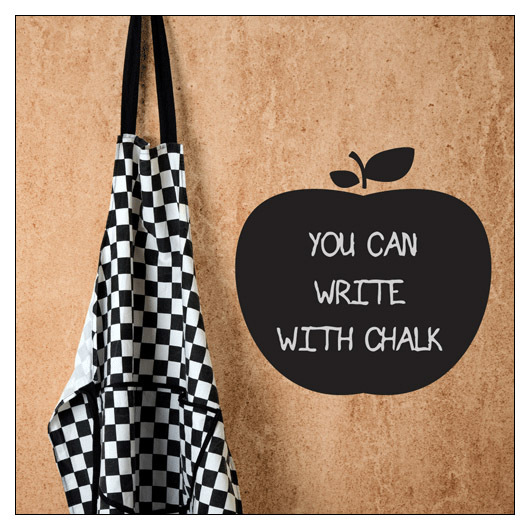 Leave a note, make a list or draw a picture on this stylish chalkboard decal that looks great in any room. Removable and reusable without damaging walls. What's Included: 1 chalkboard decal apple, and stem with leaves. 22.5"w x 18"h, chalk included. Patent pending. ** Tip: Move your apple from room to room, easy to peel off and reuse!